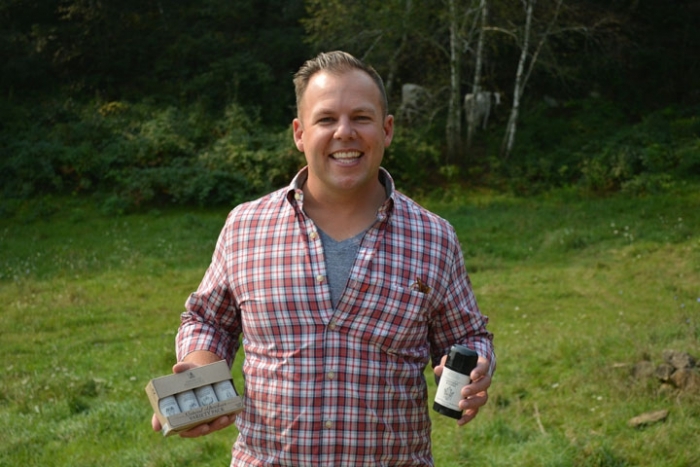 Kyle LaFond creates natural men’s care products including aftershave, beard balm, pomade, deodorant and cologne. He is currently rolling out a new women’s line of natural products as well. Photo by Matt Geiger. While researching and tinkering with ingredients, it took LaFond five years to craft and perfect a line of men’s fragrances before he launched American Provenance this past May. The products include aftershave, cologne, deodorant, pomade and beard balm, all hand crafted in small batches from the production facility on his family’s farm, which was once an old machine shed. “It’s been years in development to get to the point where I’m happy with things and feel they are the best they can be to put on the store shelf,” he shared. LaFond made all the scents subtle to reflect products from the mid-1900s. The creatively named scents include Firepits & Flannels (wood), Shotguns & Shenanigans (mint), Fastballs & Fisticuffs (citrus) and Horseshoes & Hand Grenades (spicy). LaFond, who usually grows a long beard in fall, chose to make the same four fragrances for his aftershave and cologne. He maintains transparency about each ingredient in his products and uses no artificial fillers, additives or chemicals. When LaFond started experimenting with scents and ingredients to create products for personal use, he didn’t anticipate one day opening his own business to share them with others. It all started while he was teaching science in New Glarus. After assigning a sustainability project to his class, one student challenged him to also come up with an idea. He started to mix ingredients and came up with an organic deodorant. As a former teacher, when creating his brand and packaging for his products, LaFond’s goal was to appeal to young people. American Provenance products are available at local Hy-Vee stores, Community Pharmacy, Context Clothing, Metcalfe’s Market, Willy Street Co-op and via AmericanProvenance.com.